Wine cork vs, screw top. Is it the future of our fine wine collections? Then what shall I do with the cap after Im finish opening the bottle? Now I own a gourmet shop selling wine, I can see the purpose or at least the ease of the closure. There are some customers who want only a closure due to ease of opening, then there are the traditionalist, who demand only a wine cork. After long deliberation, I can appreciate the closure for certain occasions. Nowadays, one cannot carry a corkscrew aboard a plane, so the use of a screw top would be necessary or if on a picnic. According to several independent surveys, wine consumers buy wine sealed with natural cork over any other closures. Another survey of the wine trade, suggested that most consumers think that non-closures cheapen the bottle of wine. Screw caps, on the other hand, are seen as industrial, cheap and lacking the romance of the old "closure" but they have been hailed as the future because there is no danger they will spoil or "taint" the wine, a problem that is said to affect up to one in 10 corked bottles. This raises an important question why would wineries choose to use other means of sealing their wine. The 2005 Albariño from boutique Spanish winery Viña Araújo will carry a necktag indicating the wine is sealed with a natural cork. To ensure wines of the highest quality that express the unique character of our environment, we limit production and the use of additives and other interventions in our winemaking, said winemaker José Araújo Peña. We use real cork to seal our wines because it is a natural, sustainable product that also allows the wine to develop as nature intended. Spain has passed a law that requires wineries in 11 top wine producing regions to seal their wines with cork. Under the law,wineries must use a cork closure on still and sparkling wines in order to receive DO (Denominacion de Origen) status.The use of screwcaps and synthetic closures is outlawed. Pros: Cork has a long history; it has been used as the sealing method of choice for over 400 years. Theyre a renewable resource (the trees are not killed when the bark is stripped to make cork). Theyre readily biodegradable. And they support an entire industry of corkscrews and other cork-removal products. Cons: Wine Corks often go bad. Estimates vary depending on which figures you believe, as little as 1% or as much as 20% of all wine sold is corked, which is to say, damaged by a problematic cork.) Wine corks can be difficult to remove, and sometimes break off into the bottle. 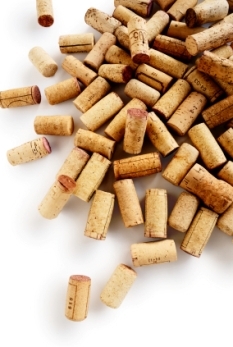 Pros: Plastic is immune to cork taint, so wine is much less likely to spoil. Depending on the vintners tastes, Theyre recyclable. And the same cork-removal equipment can be used. Cons: If not recycled, plastic corks also pose a more direct threat to the environment. The plastic may not retain its elasticity well over time, making it unsuitable for wines meant to age for decades. Pros: Screw caps, like plastic corks, avoid problems of cork taint. They are less expensive than natural or plastic corks. And they can be removed without any special equipment. Cons: As with plastic corks, screw caps imply environmental issues associated with the loss of cork farming. Whats your opinion? Where do you stand on this great debate?